ITER DG Osamu Motojima and his Chinese counterpart, Luo Delong, shaking hands after signing PAs # 54 and 55. The team that accomplished the framework for these two contracts is watching the event. The signing of a Procurement Arrangement not only marks a big milestone for the project, it is also a welcome break in the very busy ITER agenda. This week, the champagne glasses were raised on the occasion of the successful accomplishment of Procurement Arrangement 4.1.P2.CN.01 and 4.1.P2.CN.02 which symbolize the legal and technical framework for ITER's AC/DC converters and reactive power compensator & harmonic filtering. The Chinese Domestic Agency will procure all fourteen poloidal field converters that will provide controllable current/voltage to ITER's six poloidal field coils. The procurement package includes the design, fabrication, delivery, installation, assembly, integration and site acceptance test of the converter units. It is a very challenging system due to unprecedented power level and short circuit current, and the high dynamic demanding from the need of the plasma control. The Chinese Domestic Agency will also procure the ITER's reactive power compensator and harmonic filtering system rated at 750Mvar to stabilize the power grid and to provide required quality of the electrical power to operate ITER. It is a unique system due to the installed power, the extreme high demands on the response time and the expected loads. 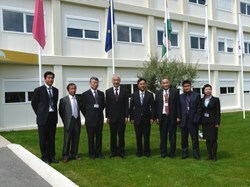 Photo session with the delegation from the Chinese Academy of Science and Technology for Development (from left to right): Fenyu Wang, the Head of CN-DA Delong Luo, the Academy's Executive Vice President Yuan Wang, Director-General Motojima, the Director-General of the Chinese Ministry of Science and Technology Jing Xu, ITER DDG Shaoqi Wang, Feng Liu and Lin Xialan. 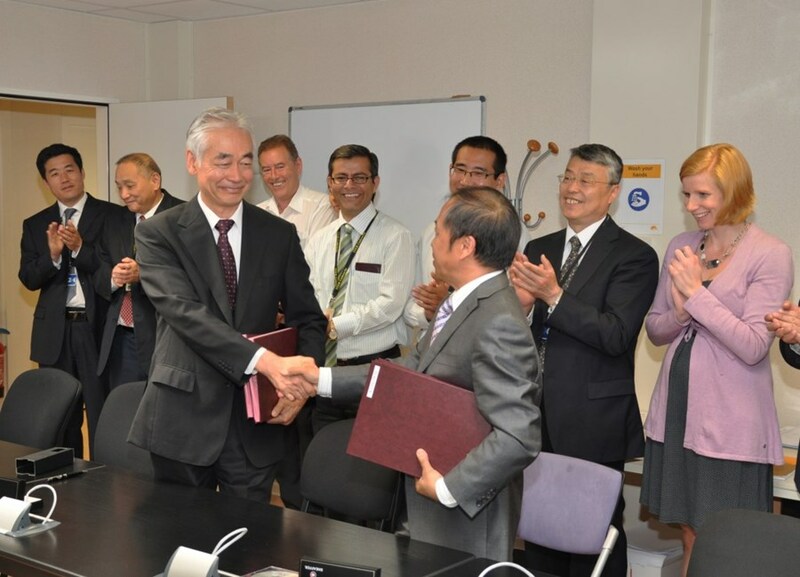 The two Procurement Arrangements were signed on Wednesday between ITER Director-General Osamu Motojima on behalf of the ITER Organization and Luo Delong on behalf of the Chinese Domestic Agency, who will procure the critical sub-system. 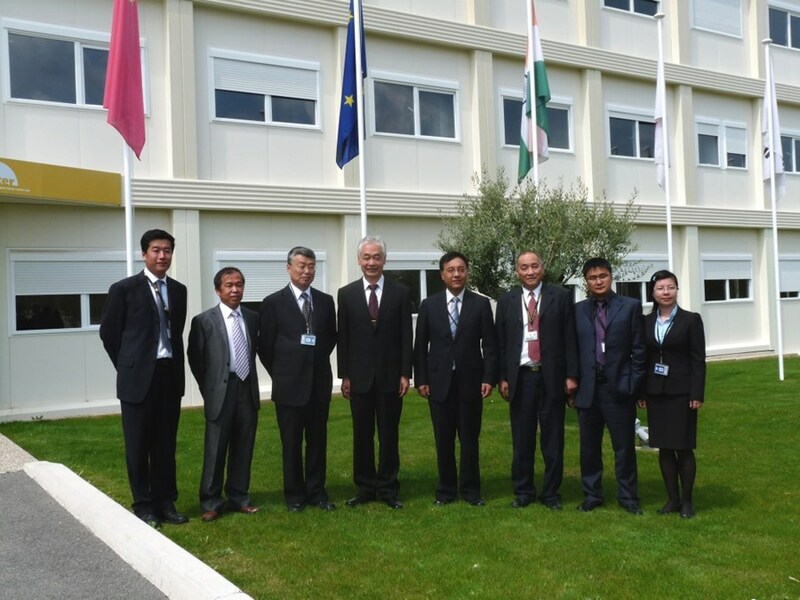 The Head of the Chinese Domestic Agency had come to Cadarache together with a delegation from the Chinese Ministry of the Science and Technology. These two Procurement Arrangements are the 54th and 55th to be signed with the Domestic Agencies. They mark another milestone as they move the project's total value for in-kind procurement to over the 2 billion ITER Units of Account (IUA) mark - 2011.3498 kIUA to be precise! This equates to approximately EUR 3.13 billion.